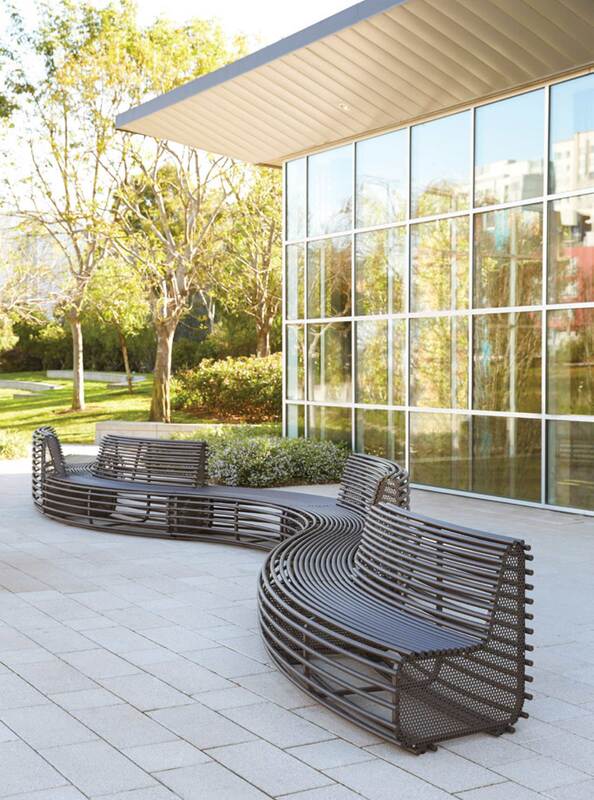 The Rio Bench was designed for a new urban multi-use district to meet the many needs of the urban plaza. 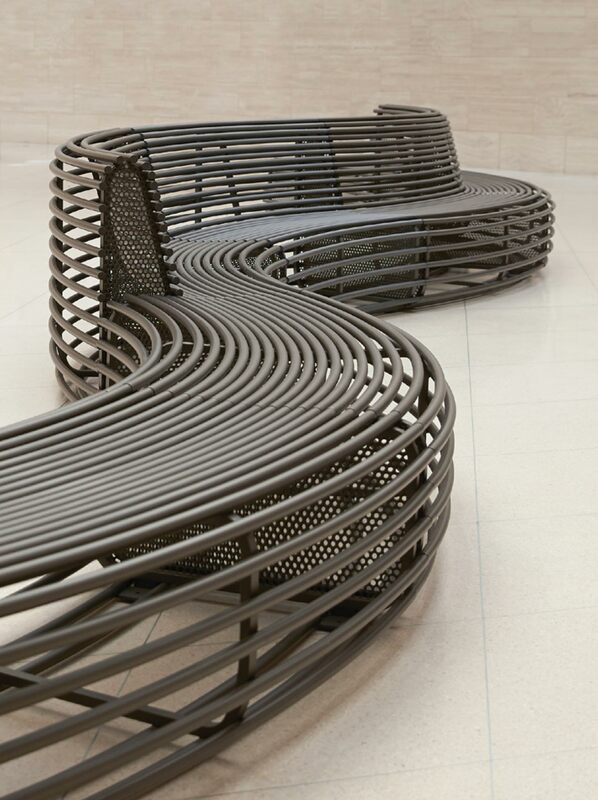 The benches’ curvilinear form and meandering patterns—as well as the name “Rio”— were inspired by the winding, eddying nature of the nearby Upper Potomac River. Rio also helps to delineate the edges of the plaza, direct the flow of pedestrians, and is easily removed for large events. The sculptural form is established through the compilation of three simple curvilinear modules: a concave bench with a seatback, a convex version with a seatback, and a flat bench that can be turned either way. 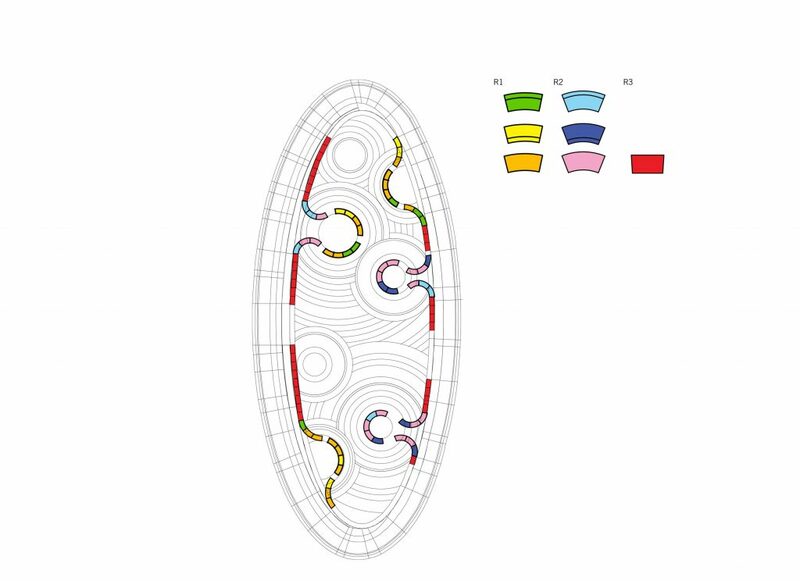 Each module can be used individually, but when used in a connected series, repeating and alternating to create endless configurations, they generate an array of arcs, parabolas, serpentines, filigrees, and complete circles. Every combination defines a new outdoor room where people can gather, socialize, or find privacy. The diverse array of seating configurations creates intimate spaces within a large-scale gathering place—the use of convex curves creates an intimate cove, almost a private room, within the larger seating arrangement, while the concave segments provide momentary stops for those just passing by for a moment. The combination allows the seating to define space, edges, and scale within larger outdoor areas all while engendering a distinct style for the space it inhabits. 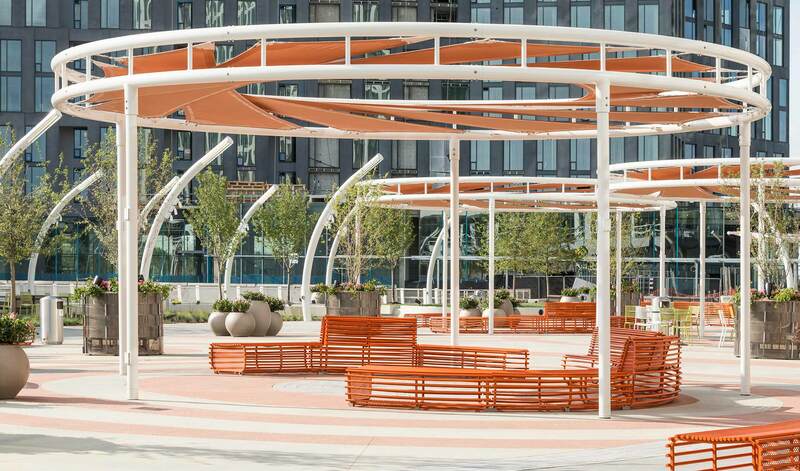 Rios Clementi Hale Studios created a manufacturing partnership with Janus et Cie that has helped them establish a presence in the street furnishings sector. The original orange color is a one-off that will never be reproduced except in its original installation. The success of bench line has inspired manufacturer to ask us to expand the line to additional components 2018. 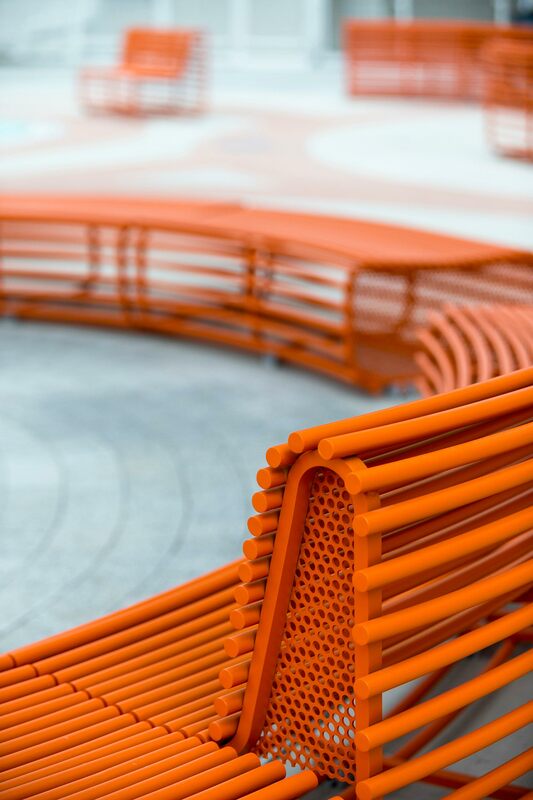 Metropolis Magazine cited Rio’s “sinuous form” and applauded the benches for adding “a dash of style to outdoor environments” in its coveted “Metropolis Likes” honor. And the design won a HiP (Honoring Industry People and Product) Award from Interior Design Magazine at the 2015 National Exposition of Contract Furnishings. Through the design process, we produced mockups out of MDF and PVC piping to determine the optimal number of rods needed for appearance, cost, and comfort. Through several iterations we changed the curvature, the spacing, and the quantity of rods. 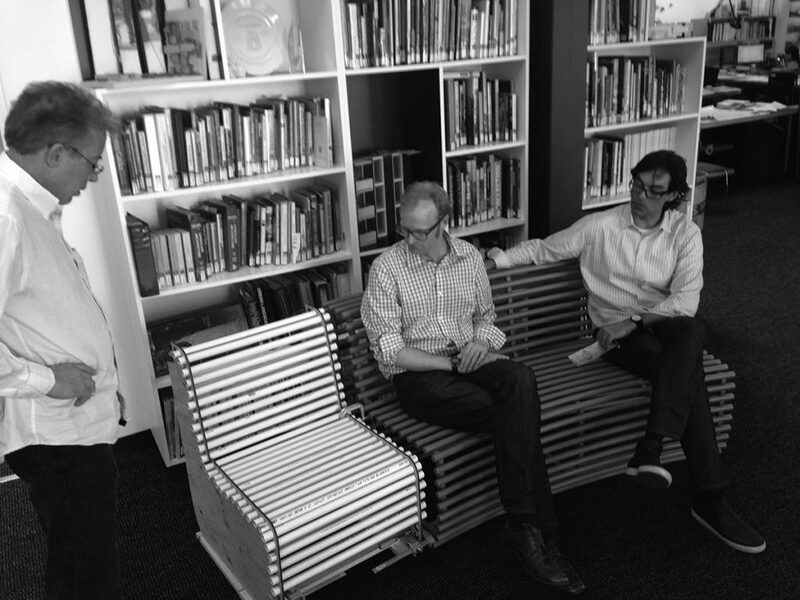 Our manufacturing partner Janus et Cie welded the benches out of solid aluminum rods, rather than steel, making them lightweight and durable. The modular, sculptural form is distinctive in its sinewy streamlines. The modular nature creates an ability to respond to users in dynamic environments, where passersby might be emerging from transit, pausing from shopping, or meeting up with friends, or in secluded spaces where flexible seating is needed.